Puzzling Queen: Cat or Corgi? 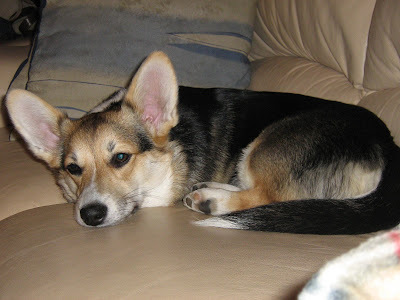 It’s been a while since I wrote about my Welsh corgi, Piitu. Now she is 8 months old and she has finished her school but I think she would need some extra classes. Now that the gardening time is over, she has been concentrating on tearing all her soft toys to pieces. 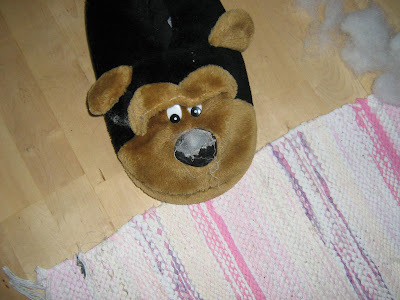 She loves to tear a small hole first and then take all the stuffing away. I have had one Corgi before and this one has a skill I never imagined a Corgi could have. She is an amazing jumper. I have found her on the kitchen table and she jump from the sofa to the armchair and it seems there are no obstacles in her way. Here is a video showing her jumps. Hi Thank you for dropping by my blog. I read your blog through my friend Jessie blog. I am a Math's addict too :):). I was a Computer Science graduate 25 years ago :). You probably guess my age, right, he he he. I have studied Computer Science too and actually studied some more now that my children are adults and I have spare time. At this time of year Florida seems very attracting. I was there once in August!!! Yes, we are still having some warm weather even at Christmas :). January get cold at times. I have added you in my friends page.